Today we are excited to share a uniquely light and flavorful recipe with you for Pink Champagne Cake. This elegant dessert, with it’s moist champagne infused layers & delicious buttercream is perfect for weddings, engagement parties, anniversaries, Valentine’s Day, New Year’s Eve, or any occasion that calls for something special. Southern bakers have been flavoring their cakes with sweet beverages for decades (cocoa cola cake, 7 up cake, etc. )…but Pink Champagne cake takes that practice to a whole new level of delicious sophistication. 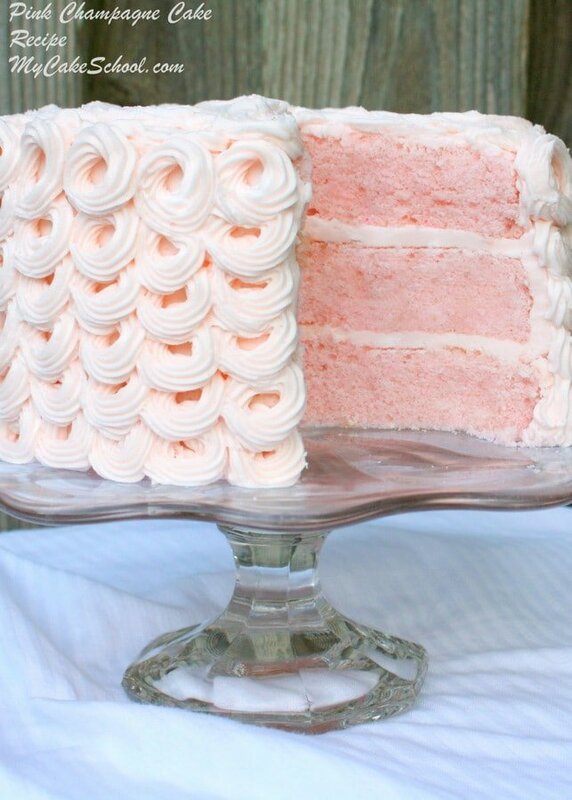 It is believed that Pink Champagne Cake first originated on the west coast in the ’50s and ’60s, and was a hugely popular to choice for bridal showers, weddings, and bachelorette parties. There’s just something a bit glamorous about a dessert flavored with Pink Champagne, don’t you think? The Los Angeles Times printed a Pink Champagne Cake decades ago and to this day it remains one of it’s most requested. If you like Pink Champagne, you are going to fall in love with this recipe. While the pink champagne isn’t overpowering, the flavor is unmistakable. We love to fill it with our Pink Champagne Buttercream Frosting, but traditionally pink champagne cakes have often been paired with bavarian cream or coconut fillings. We hope that you enjoy this fantastic recipe. Make sure to check out our Pink Champagne Buttercream link below, as well as a doctored cake mix option! In another bowl combine the egg whites, champagne, vanilla and vegetable oil. Whisk until blended and set aside. In the bowl of your mixer, cream the butter and sugar 3 to 5 minutes. When it is light and fluffy add approximately 1/3 of the dry ingredients and mix until blended. Then add 1/2 of the liquid ingredients mixing until blended. Continue alternating dry and wet ingredients. Begin and end with dry ingredients (3 additions of dry and 2 wet). Add the pink color at any time during the mixing of the dry and wet ingredients. *Makes 7 1/2 cups of batter. Pour into prepared pans and bake 25 to 30 minutes. The cake is done when a toothpick inserted the center comes out clean. Cool in baking pans 10 min. then turn out. Also, If you are looking for an easy doctored cake mix version of Pink Champagne Cake, we love this recipe! 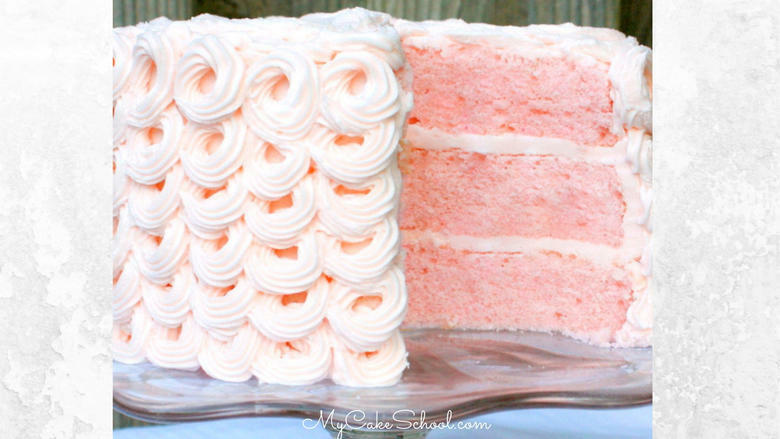 : Pink Champagne Cake (doctored cake mix) Recipe. 1/27/19 Update! We now have another delicious champagne cake to share! Don’t miss our Champagne and Strawberries cake recipe! 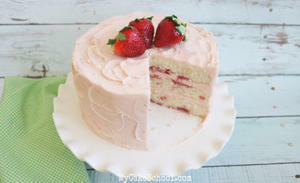 This recipe consists of Champagne & Strawberry cake layers, a whipped strawberry cream cheese filling, and Champagne & Strawberry Buttercream Frosting! A great one for your “must-make” list! Don’t miss our other favorite tried and true cake recipes in our Cake Recipes Section! If you are interested in learning more about cake decorating, we have lots of fun cake tutorials to share in our Free Tutorials section, including a Free Cake Videos section! If you would like to have full access to the hundreds of cake decorating video tutorials that we’ve made over the years, we would love to have you as a member of My Cake School! We have tons of cake tutorials for all skill levels. You can find all of the details here! : Joining information for MyCakeSchool.com. I am making a wedding cake, square, 10″, 8″, and 6″. Could you tell me how many times I need to multiply this recipe to get enough for those size cakes? I have 2″ tall pans and will make double layers. Thanks a bunch, can’t wait to try this! I think if you triple the recipe you will have enough. Do you have a mixer large enough to accommodate this? I must be figuring wrong…..in the July 1 comment, you state that 8” pans need 3 cups per pan, but this recipe says to be baked in 3 (8 inch) pans. Since this recipe makes 7-1/2 cups, does that not leave you short 1-1/2 cups? Hi Lytane, In the July 1 comment I was linking her to the Karen’s Kitchen chart that suggests 3 cups per pan. We use that batter amount chart as well as Wiltons Chart as a guideline, but you do not need to strictly stick to it. There are times we want 3 layers for our cakes because we want more filling per slice and we just like the way it looks. The layers will not be as tall but the finished cake will look good. Just divide the batter between the 3 pans. I’m glad you asked, others may have the same question. Made this cake last week for my girlfriend’s birthday. All the girls at our lunch loved it! I filled it with the pink champagne buttercream and frosted it with an Italian vanilla buttercream. Definitely adding this recipe to my favorites! is this recipe good for cupcakes also ? Hi Adrienne, Yes the recipe does work well for cupcakes. I left a comment about my cake getting hard when I cooled my cakes? What would have caused that? Hi Stacie, I am sorry you had a problem with your cake . There is possibility that your oven may be baking at a higher temperature than what you have it set to. Check this with an oven thermometer. An overheated oven can cause your cake to be overbaked with hard edges. Were you using dark pans? If so, you should reduce the temperature by 25 degrees. It is best to use light colored pans. I am assuming you were using 8 inch pans, but if you are ever baking in pans 10 inches round or over or sheet cake pans, it will take longer for them to bake in order for the center to bake completely. You would need to put a heating core or rose nails in the center of the pan to help the cake bake more evenly. I hope this helps. Did you use regular or clear vanilla in the cake and frosting? Hi Mary, I usually specify if I use clear so I must have used regular vanilla, though it would be fine to use clear if you would like to do so. I made the cake and frosting. It was delicious! However, my buttercream wouldnt set up! It kept falling off the cake so I couldn’t give it to my friend. The taste was delicious so I’m bummed. I want to remake but any advice for the icing?? Hi Cherbear, I am very sorry you had a problem. If it was falling, it was too soft. If you were making the buttercream on a humid day that can affect the amount of liquid you need. The next time you try, don’t add the champagne all at once. Add gradually until it reaches the consistency that works for you. Were you piping the same design on the side of the cake that Melissa used? If you were, also make sure that the top of each circle touches and attaches to the side of the cake. If the circles are attached to each other, it can slide down. Hope this helps. Are there any changes that need to be made to make into cupcakes? Hi LaQueanya, You do not need to make any adjustments for cupcakes. Bake the cupcakes for 18 to 20 minutes. The cupcakes will bake up with very little dome. Hiya, did you use self raising flour or plain flour? Hi Beth, Use plain flour ….our US all purpose flour is the same as your plain flour. Hope you will enjoy the recipe.